To everything there is a season. 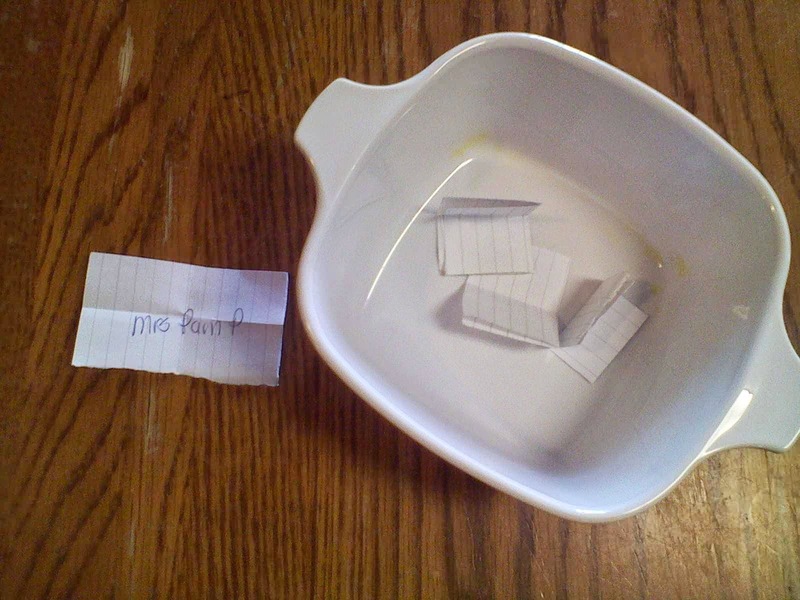 ~Ecc 3:1: We Have a WINNER! We would encourage you to stop by and say hello to her...we have been blessed by her blog and getting to know her. She has a lovely home on the web filled with tips, yummy recipes that we have been able to make, home-making and encouragement! Why don't you take a visit...? 13 candy bars in the mug!! Thank you all for guessing and may you all have a blessed Thanksgiving enjoying some of your favorite foods!
" 1.Make a joyful noise unto the Lord, all ye lands. 5 For the Lord is good; his mercy is everlasting; and his truth endureth to all generations." Don't forget!! You only have a couple hours left before the winner for the giveaway will be picked!! If you haven't already.........hurry and get your name in!!! I am wanting to say that this pic is not very good of the items and just a lil-hint those are mini Hershey bars and they are stuffed in the mug! and every fall/Thanksgiving I made some craft and or decoration that she would look forward to. along with I am adding a sweet mug and some warm drinks and chocolates eat! 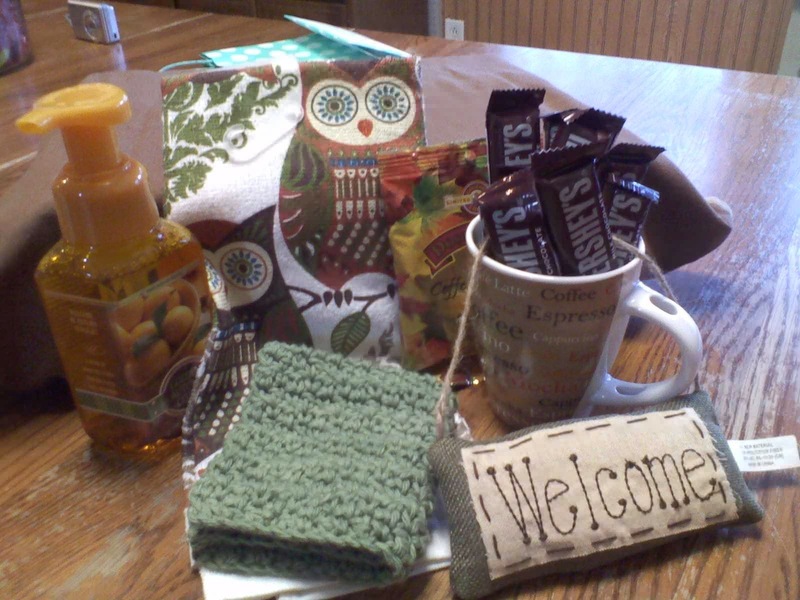 She loved owls and I saw this sweet lil-owl dish towel I made the wash cloth to match. The lil-welcome sign is a sweet Hobby Lobby find! I would love to send this set out to some one to give it a nice home for the Thanksgiving time! 2. A favorite that you love at Thanksgiving! We will be picking the winner on Wednesday! Sweet!! 7 bars. Sweet potatoes!! Sweet!! Oh, I love it all..
Oh I would be so excited to win this in honor of your sister. I counted 7 bars that I could see but I think there may be one hiding so I am guessing 8. :) What a lovely giveaway. sorry to hear about the loss of your sister. My dear Lori, what a beautiful giveaway you have put together in honor of your precious sister. I am going to say there are 8 Hershey bars in the mug. A favorite thing I love about Thanksgiving is being surrounded by family - it's such a joy! And since the other ladies that commented said their favorite food than I guess I will too :) I LOVE the stuffing - yum! I hope each and every one of you are well. Please tell the girls I said "Hello!" Love and blessings to you! What a sweet giveaway. Fall is such a beautiful time, and I bet you miss your sister very much. Love the owls too. Lets see; I believe you have 8 chocolate bars there. I love Fall, and Thanksgiving; I love the fires in the wood stove, and the warm sweaters, but most of all I love having family home for Thanksgiving, and cooking favorite foods for them, and sitting around together drinking coffee and catching up…. I guess I couldn't say just one thing. Have a lovely week. Dear Lori and Maggi and Family, I am so excited about winning this and will be looking for its arrival with anticipation. Thank you so much! You are Dears. You really fooled me on the chocolate bars; wow! It didn't look like there were that many there. Again, Thank you so much. Congratulations to Pam!!! I am impressed with the number of bars in there. Wow!!!!! :) I had no idea there were sooo many. Congratulations to Pam! She won a delightful giveaway :) Hugs to you!